The American Cowboy Chronicles: Brian Terry Used Bean Bags Instead Of Bullets Before Being Killed! Brian Terry Used Bean Bags Instead Of Bullets Before Being Killed! U.S. Border Agent Brian Terry Used Bean Bags To Defend Himself Against Bullets Before Being Murdered. This is as insane as it comes! Just insane! But yes, mudered Border Patrol Agent Brian Terry was defending himself with "Bean Bags!" Yesterday, the Justice Department unsealed an indictment charging five people in the death of U.S. Border Agent Brian Terry in December of 2010. Brain Terry was the Border Agent who was murdered by killers of a Mexican Drug Cartel. They were armed with assault weapons trafficked into Mexico by Eric Holder's Justice Department. The indictments were supposed to be big news - but no, that's not the insanity that absolutely shocked me! The craziness was what the Justice Department revealed after their announcement of the indictments. For the first time since Terry's death, yesterday they revealed for fact a truly disturbing aspect of how Agent Brian Terry was killed. Federal Officials revealed that Agent Terry and the "Elite Squad" of Federal Agents initially fired "bean bags" - not bullets, but bean bags - as the heavily armed Mexican Drug Cartel crew shot them to pieces and killed Agent Terry with real bullets! Yes, it happened in the mountains south of Tucson, Arizona, in December 2010. Yes, during the exchange, Terry was shot and killed. But now, now, I can't help but ask who is the person, or persons, who is responsible for ordering our agents to use "bean bags" instead of bullets? And yes, whoever the hell he or she is, why isn't that genius on trial as an accomplice to his murder?! Non-Lethal Bean Bag Rounds versus Bullets? Bullets Win! Bean Bags? Bean Bags? He was being shot at, and he returned fire with bean bags? I can't imagine the horror of it! That is as insane as it comes! I can't believe that anyone would actually be so dumb, so stupid, so ignorant of the need for deadly force when your life or the life of someone else is in mortal danger - that they would actually arm those in the line of danger with "non-lethal" weapons. March 9th of 2011, Department of Homeland Security Secretary Janet Napolitano testified in front of the Senate Judiciary Committee hearing saying that her "Our lethal force policy is the same as virtually every law enforcement department I know of in the country. That is, if you are under threat of serious injury or death, you may use lethal force." Of course, from her statement it's obvious that she has no idea of what she's talking about. To say that you first respond to a threat to your life with "non-lethal force" then "if you are under threat of serious injury or death" shows that she has no knowledge of what she's talking about. Fact is, it happens in seconds if that! It's the first few critical seconds of a gunfight that mean everything to who walks away to talk about it. A person's first response to a threat is the difference between life and death. In this case, now I understand how and why Border Patrol Agent Brian Terry died. He used "bean bag" rounds instead of bullets and died because of it. "When the suspected aliens did not drop their weapons, two Border Patrol agents deployed 'less than lethal' bean bags at the suspected aliens," according to the FBI document. "At this time, at least one of the suspected aliens fired at the Border Patrol agents. Two Border Patrol agents returned fire, one with his long gun and one with his pistol. Border Patrol agent Brian Terry was shot with one bullet and died shortly after." My opinion is that those first few critical seconds between applying Napolitano's Political Correct solution like "bean bags" to a threat - and the suspects returning fire with real bullets - was all it took to get Agent Terry killed. It has been reported that Border Patrol Agent Brian Terry and the BORTAC team were under standing orders to always use "non-lethal" bean bag rounds first before using live ammunition. And yes, since learning about this, I'm surprised that more law enforcement along the border isn't dead. Napolitano's Department of Homeland Security came under fire for it's "bean bag" policy, which I believe played a role in the December 14th, 2010, killing of Border Patrol Agent Brian Terry. Napolitano did not dispute that 40-year-old Terry himself fired bean bags, and that is how a recently-disclosed FBI document filed in federal court described the incident. It's believed that Agent Terry - whose team was part of a special tactical unit within the Border Patrol - was armed only with bean bags while others had more powerful weapons. Recently, Attorney General Eric Hold was charged with Contempt of Congress. If indeed it was Janet Napolitano's Department of Homeland Security policy that is responsible for this, then she should be tried. I personally don't care how high she is in the government. If it was indeed her policy to "first" use "non-lethal force" such as bean bag rounds in an apparent threat, then she should be arrested and tried as complicit in the murder of Brian Terry. Why didn't they just disarm him altogether? Why allow him a weapon? Why was he there literally unarmed? At this point, I don't give a damn about the Justice Department unsealing the indictment Monday. Right now, I really don't care about charging five people in connection with Agent Terry's death, or if the Justice Department has announced a reward of up to $1 million for information leading to the arrest of four suspects who are still at large. Right now, I want the person who armed Border Agent Brian Terry with BEAN BAGS! I want that person to sit in front of the Terry family and explain why they put out a directive instructing him to put his life second to an assailant. I want someone to explain the use and effectiveness of "bean bags" against the Drug Cartel's killers in a life and death situation. Then, I want that person to explain the logic behind their decision to arm him with bean bags. I want that person to look the Terry family in the eye and apologize for getting him killed! It sounds like a combination of Napolitano's Department of Homeland Security "non-lethal force" policy and the Justice Department's Fast and Furious gun-running operation that got Agent Terry killed. We know he was killed with weapons that came from the hands of our Justice Department's people. We know the weapon that killed him was from that program because it was found at Terry's murder scene. Now we know he was virtually un-armed in the first few critical seconds, while his killers were. According to the indictment, the five defendants are charged with crimes including First-Degree Murder, Second-Degree Murder and assault on a Federal Officer. The indictment alleges that the five defendants also assaulted three other Border Patrol agents who were with Terry. Eric Holder said, "Agent Terry served his country honorably and made the ultimate sacrifice in trying to protect it from harm, and we will stop at nothing to bring those responsible for his murder to justice. This investigation has previously resulted in one defendant being charged with Agent Terry's murder and taken into custody, and today's announcement reflects the department's unrelenting commitment to finding and arresting the other individuals responsible for this horrific tragedy so that Agent Terry's family, friends and fellow law enforcement agents receive the justice they deserve." I really believe that those are only words for the Nightly News. I doubt if they will ever look into who sent Brian Terry out there literally un-armed with only "bean bag" rounds. 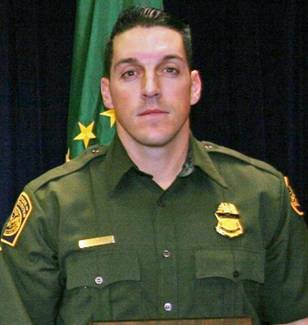 U.S. Border Agent Brian Terry shot bean bags and not bullets during the first few critical seconds of the shootout with the murderous Drug Cartel members. They returned fire with bullets, and shot him dead with assault rifles. He may as well have been unarmed. That got him killed! Blood is on the hands of those who trafficked the guns and instituted the "non-lethal force" policy. This insanity is something that really needs to be addressed. Someone has to be made accountable for his death. My heart goes out to the Terry family. And yes, I'm sure that I'm not the only American who is angry that Brian was disarmed by the very government bureaucrats who armed his killers.